The Teachings of Lord Caitanya is one of Srila Prabhupada’s most important books. It is a summary study of the Sri Caitanya-caritamrta and contains the life and teachings of Lord Sri Caitanya Mahaprabhu who appeared in West Bengal around five hundred years ago and who is Lord Krishna Himself appearing in the mood of a pure devotee of Krishna. To download Teachings of Lord Caitanya please click on the book cover image on the left. These words of the massive Srimad Bhagwatam, recorded by the author of the famous Bhagavad-Gita, Vyasadev, foretell the advent of Lord Chaitanya Mahaprabhu. Lord Chaitanya, like Christ, was a spiritual revolutionary Who taught that conceptions of being Hindu, Christian, Muslim, black, white, male and female are “bodily designations that are finished when the body is finished.” His Peace Formula is this: all living entities, including trees, bacteria, ants, cows and humans are eternal spiritual sparks of the Supreme Lord and all are brothers who have the same One Father. In Teachings of Lord Chaitanya, A. C. Bhaktivedanta Swami presents to the West the sublime life and teachings of this great transcendental Personality of the 15th century Whose Sankirtan Movement swept first India, and now the West. Many philosophers recognise God to be a force that is beyond name or form, but Chaitanya Mahaprabhu taught that God is a Person Who has Form, Qualities, Name and Pastimes–but Who is nevertheless Absolute and Transcendental and beyond anything we have experienced in this material world. Lord Chaitanya journeyed up and down the subcontinent of India to deliver the easiest, most glorious method of self-realisation: chanting of the Hare Krishna Mantra. His explanations of the esoteric Vedanta Sutra converted many impersonalists, turning them “from dried sticks into blooming flowers.” He led thousands in massive Kirtan parades of ecstasy, and even caused tigers in the jungles to swoon. Teachings of Lord Chaitanya is a remarkable book which answers definitively the unanswered questions burning within man’s heart. The Swamiji’s chapter entitled “The Beauty of Krishna” is a description of the stunning beauty of God which stands by itself as one of the most sublime lyrical achievements in all mystic literature. His vast scholarship qualifies him as the most erudite Vedic scholar now writing in English. As Acharya (meaning one who teaches by example) of the Sankirtan Movement today, the Swami lectures at numerous temples and writes out of his daily experiences with the authority of a master, so that his books are both learned and practical, instructive as well as deeply moving. To read A. C. Bhaktivedanta Swami’s books is to understand that here is one who knows the Absolute Truth, one who can teach it perfectly. Please add the year of publication of this original book pdf on this page for convenience to people searching for a date. The original publication date of Teachings of Lord Caitanya is 1968. 1)My friend has read almost all the books in the Book Distribution Megapack except TLC. Could you please suggest to me whether to give her the book before she reads SB? Will she be able to understand it. Personally I felt that it was easier to understand TLC after having read SB. 3) Another friend of mine has access to computer and has also read all books in the megapack except TLC. Although she can read SB first ,she likes to read in books so I have to give her the TLC . So is it okay if she reads TLC first and then SB. Will the philosophy go into her head? I wish to remain your eternal humble servant…..
Let them read the Teachings of Lord Caitanya… That will be very good for them. They do not have to read the Srimad-Bhagavatam first. 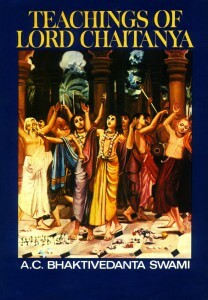 Hare Krishna, is there a list of Srila Prabhupada’s books (titles) in chronological order? Thank you. Gone through the articles. I have no negative remarks against any Saint(Rishis) or seers. Still I am interested to find out the truth. Accordingly to different sources like Veda and Puran, Vyyas was the complier of Vedas as well as Mahabharata. Further I came to know that Manu the son of Brahma was the first man, but who was first women, I am under suspense. I do admit that creations mean there most be a creator. If Brahma is creator, Vishnu is preserver and Shiva is destructor, then how the entire earth was populated with out a wife of Manu? Who was the wife of Manu? Further I may say that why the concept of Idol worship still exist in India? Why the concept of Bible,Quran and Geeta differ. I do admit that the the people who have writeen Purans,Bhagabata Geta,Bible and quran are the divine people. But still I am under suspense. All these things are clearly and elaborately discussed in the beginning chapters of Srimad-Bhagavatam. Krishna can create without the help of a wife and so can Lord Brahma. Many different living entities and species of life were born out of the body of Lord Brahma and some of these were prajapatis who, in turn gave birth to many different species of life. It is a great science and you have to study it in Srimad-Bhagavatam, it is not possible to describe it in a few paragraphs. As far as “idol worship” the Vedas does not in any way support “idol worship”. Krishna agrees to appear in the form of the Diety and in that form He accepts the worship from His devotees. The Deity of Krishna IS KRISHNA. It is not an “idol”. This you can practically realized if you worship Krishna. You will gradually see that the deity is not a brass or marble from at all, He is Krishna. This requires realization.